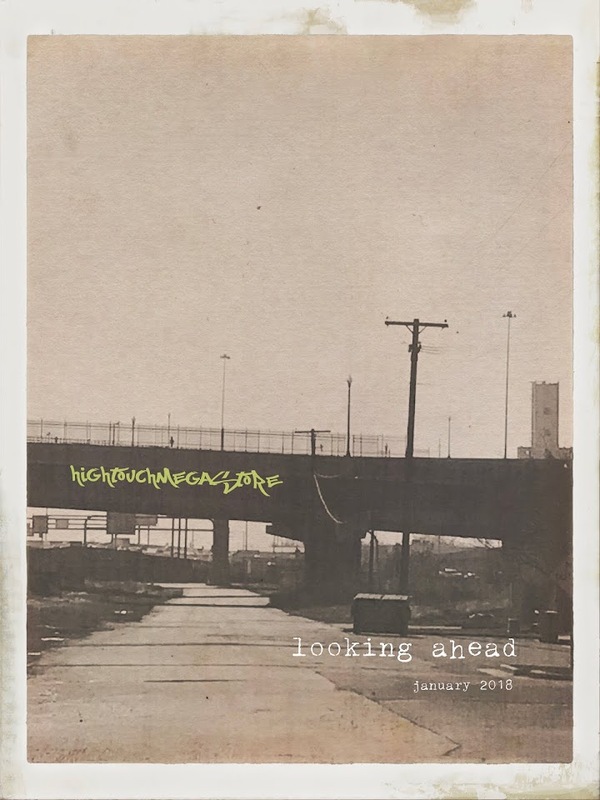 hightouchmegastore: Personal Cinematic History: The Traumas. I have often said that I am the person that The Scarers in the movie industry have me in mind when they devise their movie scares. I am perfectly calibrated to jump at the thrill of atonal strings, at the sudden, loud noise, at the lurching close-up. Blood and gore that other people categorize as cartoonish seems very bloody indeed to me. 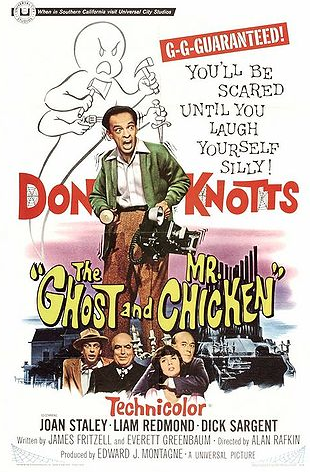 I trace it all back to Don Knotts and The Ghost and Mr. Chicken. a murder (with blood in it). A possible murder (with possible blood). a scary, ghostly organ/organ player in the organ loft (very scary)--an organ that seems to be playing itself! or being played by a ghost! the ghost of a murderer! Well, it was all supposed to be hilarious--Don Knotts is, or was, the signifier of that--but all that dried, ancient blood on the organ keys just sent me around the bend. Also, it may or may not have been at that same time that the previews for Hush Hush Sweet Charlotte were on at the theaters--I know we were living in that same house, because I remember sitting on a fence and talking about how scary it was with one of my friends. Just the previews of that movie were the stuff of my nightmares: Bette Davis as Charlotte is haunted by the murder of her young love. As an aging woman, living in a terrible old Southern house, she keeps hearing harpsichord music (terrifying, obviously) and hallucinates the decapitated head of her lover. That, the people, is way too scary for a child! But this was back in the day when there weren't a million movies at a time, and especially not on an Air Force base, so everyone saw all the previews, scary or not, and therefore all the little children had nightmares. In Japan. I think you can see where I'm going here: this is how I learned to loathe scary movies. Well, in The Ghost, Don Knotts/Mr. Chicken vanquishes his trepidations, and the mystery of the long-ago murder is resolved in a fairly twisty denouement. But no big deal, just as things are getting all happily ever after-ish, the organ keys start to play by themselves again. I suppose that little turn was supposed to be witty and charming and lightly scary. It sent me around the bend all over again. I had to whimper my way through the "it's only a movie" explanations of my parents, who, I'm sure, were baffled and slightly annoyed and maybe just a little bit amused that the kid can't sort her Guignol from her Knotts, her ghoulish from her comic. Also, Charlotte went insane, in case you are keeping track. So: murder, inexplicable musical shenanigans, insanity. Bette Davis gets driven away while Patti Page sings that song that is more terrible than anything, because insanity and murder and so forth. 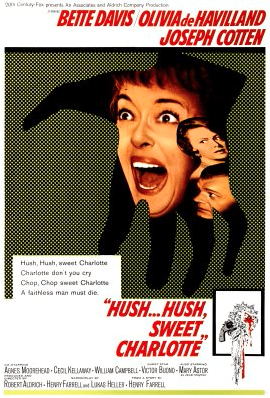 I've never actually seen Hush, Hush Sweet Charlotte. I think I might be able to laugh at it now, maybe. Maybe if I saw it on television. I would rather keep, I think, the power of that particular terror in memory. It is not a pleasure I seek, or seek rarely, to be terrified by a movie, but the memory of having been terrified is in the bones of my movie history, and thus of my movie love. Some Zombie movie dad was watching, I think a Romero one. I cannot to this day handle Zombies. Except in Sean of the Dead. I make an exception for that. Also movies I wouldn't watch based on the fact that the trailer: Fairy Tale Theater's The Emperor's Nightingale. Mick Jagger, you freaked me right out. I loved this. I'd forgotten about the organ keys at the end of The Ghost and Mr. Chicken. Alarming! Oh, Don Knotts. I loved how he wore a man scarf later in his career when he showed up on Three's Company. I remember we got to watch The Ghost and Mr. Chicken one day in school when it was too stormy for an outside recess, so I have very pleasant associations with that movie. And it was almost like Don Knotts was so scared that he was being scared for the rest of us. We didn't need to be. Loving these cinematic posts, btw. I'm with Radagast -- love these cinematic posts, HT! I am and forever will be terrified of "The Watcher in the Woods." Thanks, Disney, for nothing! I have never watched that movie without a sofa cushion or blanket covering most of my face. Maybe it was a crazy Bette Davis thing? Not so long ago, when Blockbuster was still alive, I was coerced into watching the"Blair Witch Project." When folks left, I had to lock the DVD in my car (under the spare tire) and then run up the stairs as I turned on every light in the house. I slept with the lights on for a week.